#3, and three alone. My bedroom is securely where I left it. Maya is sleeping soundly with her pacifier. I am now donning a new cropped coif. I am still tattoo-free. And I am 100% not pregnant (although the stomach bug I am suffering from today is not far from it...) Thanks for playing along! Post edit: I woke up and got ready for the day, photographed my new do, then promptly got the stomach flu. I promise I don't look this put together when I am sick. Ha! And I started cutting my own super short hair in college. I'm sure it's not perfect. But thinning shears help ensure a better cut. It's the only cut I can do myself. Oh My GOSH...It is darling! And, I was right. I picked #3!! I can't believe you cut it yourself. Nice job. You look amazing. It is awesome! But I am still amazed you did it yourself!!!!!! Maybe you could celebrate the new DO with a tat! Absolutely love it! You are so gorgeous and totally rock that do! Yay! I was right too! oh, i love it! pixies look so great on you. I thin when I very first started reading your blog you had a super short cut and I was like, "Ah, to have the bone structure for short hair!" You are gorgeous. I thought it was the hair. I cannot believe you did that by yourself! You look amazing with short hair, I think it suits you best! Did you take this photo on the day you had the stomach flu... b/c it's not fair you look that good when sick. Love it! I'm so impressed, Lyndsay! You never cease to amaze me. Who knew along with everything you do, you can also cut YOUR OWN HAIR!!! You look amazing! The cut is awesome, and you were made to sport a little pixie. I love it! I can't believe you did that yourself. And I totally wish I could pull off a pixie. I think my face is too round. 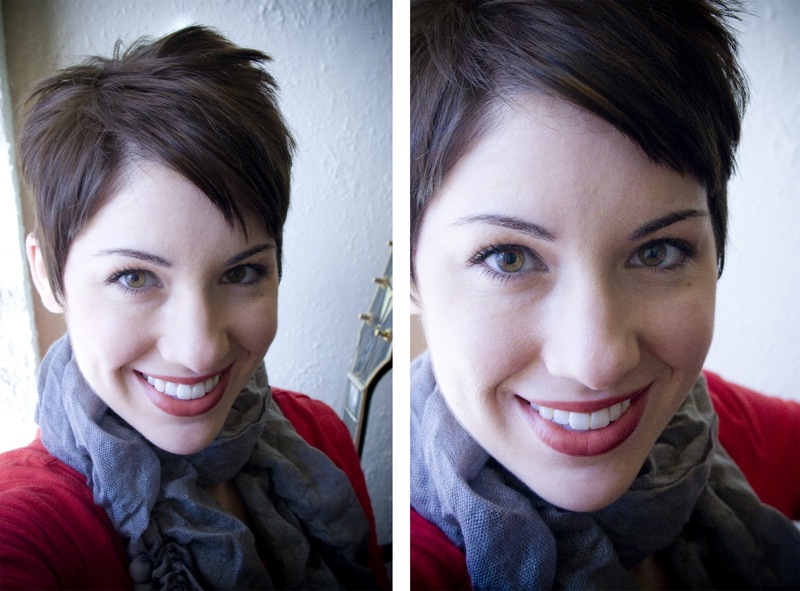 Short hair looks so good on you, Lyndsay! I am AMAZED that you can do that by yourself. It looks great! PS So sorry you are sick! Wow! I love your hair - I only wish I could pull of a hairstyle like that. And I can't believe you cut it yourself, how on earth did you do the back?? I LOVE it! Not many people can pull short hair off like you do. It looks beautiful! Sorry you got sick. That is no fun! And yay! I guessed right. Although I really had a hint because of the comment you left on my blog. LOVE it! maybe i'll follow suit. ya wanna cut my hair? So adorable. I always tell my husband that only the most confident of ladies can pull off a pixie. There is nothing to hide behind. And the fact that you did it yourself. Now I am just jealous. If I tried to cut my own hair I would look like a boy circa 1986. Or Sue Sylvester...and I may or may not be speaking from experience. LOVE the new hair! I can't believe you did it yourself!!! Oh man my Veena Neena dreams dashed again! Just kidding, you look way pretty. Much better that when I attempted the same thing! i love the new do!! I love the ixie. An I too, cut my own hair. I have for years. Mainly because my hair has a tendency to grow seemingl overnight, so one day I am good and the next day I look like a shaggy monster. And you can never get into the good stylists overnight.